In an evening of nearly-nonstop laughter, actor Christopher Plummer was awarded the Santa Barbara International Film Festival’s highest honor, the Modern Master Award, for a lifetime of film and theater achievement. Plummer, who is best known for his roles in “The Sound of Music” (Captain Von Trapp), “The Insider” (Mike Wallace) and recently “Beginners” (Hal Fields) and “The Girl with the Dragon Tattoo” (Henrik Vanger), joined the company of past recipients of the SBIFF Modern Master Award such as Christopher Nolan, George Clooney and Cate Blanchett. He accepted his award Saturday evening at the Arlington Theatre. The ceremony consisted of film clips and an interview that exposed Plummer’s lively personality. Freelance film critic Pete Hammond facilitated the consistently-well-flowing on-stage conversation with Plummer, driving the Arlington audience chronologically though five decades of cinematic excellence, shown by both Plummer’s words and his film work. The interview seemed more like catching up with a fun uncle or an old friend than listening to a screen star speak. Plummer constantly caught his audience off-guard with amusing one-liners and surprising opinions while going through different points in his illustrious career. Notably, Plummer expressed his annoyance while discussing one of his classic films, one that many college students may find particularly memorable. When Hammond commented on how “The Sound of Music” has lived on since 1965, Plummer said sarcastically, “Oh yes it has,” with the hint of an eye roll. Not only did the ceremony help the audience get to know Plummer and pay homage to the legacy of his work, it also painted him as a symbol for the glory of filmmaking as both art and inspiration. The event hit its climax with a quick but poignant speech by Roger Durling, executive director of SBIFF. Durling noted the impact of Plummer’s legacy by explaining how Plummer’s interpretation of the character Captain Von Trapp was actually the reason he fell in love with art and film–“The Sound of Music” was the first movie he ever saw. Mike Mills, director of the film “Beginners” presented Plummer with the actual physical Modern Master Award. Mills articulated how much Plummer’s performance meant to him, as Plummer played a character based on Mills’ own late father. 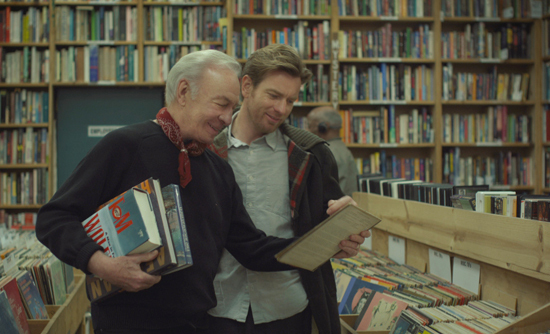 “Beginners” tells the story of Mills’ father, who came out as gay after his wife passed away, and juxtaposes his experience with a romantic experience of Mills’ own. Mills emphasized that Plummer did indeed take life by its throat through his passionate and caring approach to both life and acting. The evening concluded with a standing ovation for Plummer; not a body in the house was sitting during the final enthusiastic applause. “It was a great event. He was amazing, and all the video clips were amazing,” said Julian Michalowsai, a SBIFF pass-holder, after the event. With Plummer’s second Oscar nomination in hand (this time for “Beginners”), a lifetime of work to be proud of, and more projects to come, it’s safe to say that Plummer’s career is resting on a high note. “I’m absolutely thrilled that I’m working more than I’ve worked in ages. It keeps me young,” said the 82-year-old Plummer, to which the audience erupted in enthusiastic applause.